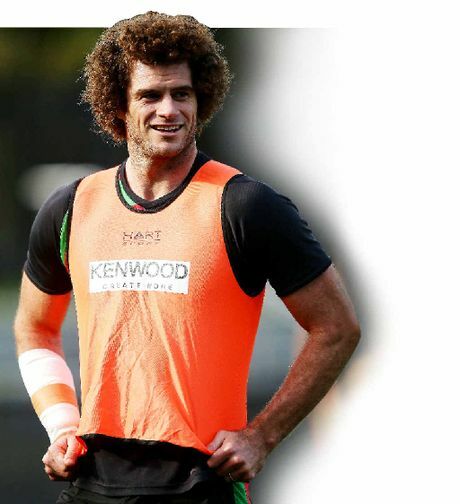 RETIRING Rabbitohs centre Matt King said he is on the verge of agreeing to a non-playing role at Redfern club from next season onwards. The 33-year-old has stated his desire to help coach at the high-flying club in some capacity, but the affable Casino junior wouldn't be out of place in an ambassadorial or speaking role. "This old rig has had enough. It's time to take the key out of the ignition and hang the boots up," he joked. WHILE many Wallabies fans were surprised at the almost unheralded Brumbies halfback Nic White making his debut in the No.9 shirt in place of superstar Will Genia against Argentina earlier this month, Knights back-rower Alex McKinnon certainly wasn't. "Nic was really, really, really competitive at every sport he played. He's the most competitive person I know," said McKinnon, who went to St Joseph's High School, in Aberdeen in country New South Wales, with White. The two have been great mates since the age of five. JAMIE Dwyer, co-captain of the Australian hockey team, the Kookaburras, is known as the best player in the world. The Rockhampton-raised man also could have reached lofty heights as a cricketer. He hit two tons in two A-grade finals in his home town during his mid-teens. "I loved it growing up, but I preferred the faster pace of hockey," he said. Dwyer has a passion for coaching hockey, as you will see on his website. BRISBANE Bandits pitcher Ryan Searle cannot wait to see his side finally play at a purpose-built ballpark, Holloway Field in Newfarm, this ABL season. "It's fantastic for baseball. To have a purpose built facility where we can call our home has been a long time coming," he said. "It's also going to be an awesome fan experience; they will really feel into the game in the closer confines of the park, and from what I've heard, there'll be cheaper food and drink prices too." Can the Brisbane Bandits steal win from leaders Perth?